The AEM 26-2100C fits some Hyundai Genesis Coupe models. See vehicle applications for details. The AEM 26-2100C Intercooler Kit must be installed with AEM Cold Air Intake System part 21-687C or part 21-687P. Intakes are sold separately. 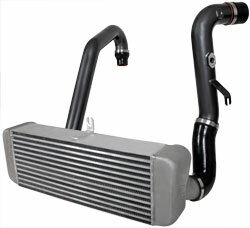 This intercooler kit is a comprehensive bolt-on air cooling system. It contains all hardware necessary for installation. The large bar-and-plate intercooler core replaces the factory intercooler. The AEM intercooler core is capped on both ends with end tanks that are optimized to evenly distribute airflow across the core. Charge pipes are also included in the kit. They are constructed from high-quality mandrel-bent aluminum.